Take in far-reaching lake views from this balcony home, which is perfect for flexible group stays on timeless Lake Maggiore! Inside this 3-bedroom, 3-bathroom home, the recently refurbished space features an ambient ground floor living room with fireplace and adjoining family kitchen diner, with access to a sunny alfresco dining terrace. A spacious upstairs living room with double sofa bed and lake view balcony is complemented by a flat-screen TV, whilst a private sauna and laundry facilities can be found to the ground floor. 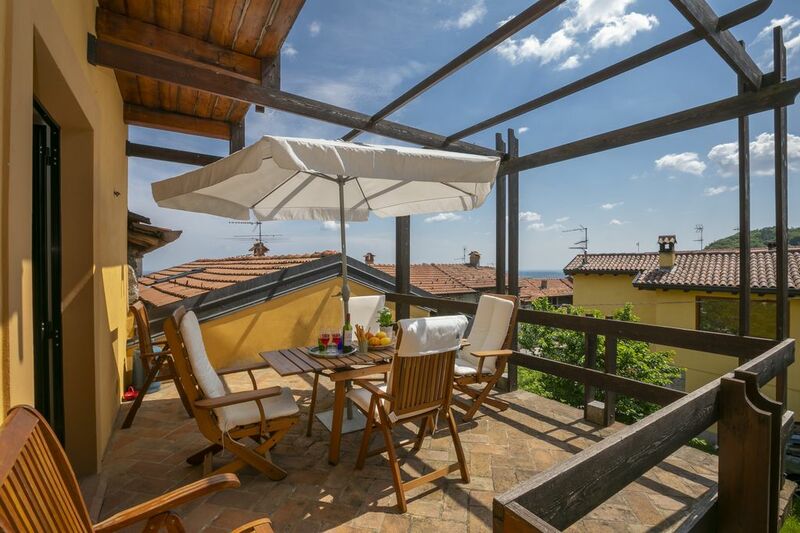 The modernized 3-storey home is situated in the hillside village of Nebbiuno, close to public parking. The apartment is located along the pleasant scenic hillside road of ‘Vicolo Reale’ in Nebbiuno, 8 minutes’ walk away from the ‘Circolo Gatto Blu’ restaurant and 11 minutes’ drive away from Meina train station. C’est une maison agréable en hauteur et au coeur du village. Bonne immersion dans l’atmosphere de ce pays. La proximité du lac est un atout. La maison est cependant difficile à trouver et la route tortueuse. Nous avons passé un bon séjour.